Numerical reasoning and data interpretation tests are routinely used in recruitment procedures. These tests represent a considerable challenge for many candidates, and the prospect of facing them can be daunting. Designed to help anyone lacking in practice or confidence, "How to Pass Numerical Reasoning Tests" will prove an invaluable resource for those who need to brush up on their maths skills. An overview of the basics is followed by a step-by-step guide to numerical tests including fractions and decimals, rates, percentages and ratios and proportions. Now including a brand new chapter on word problems to help you with your analytical skills, this second edition of the best-selling book is the only numerical reasoning resource that focuses specifically on the core areas of numeracy. 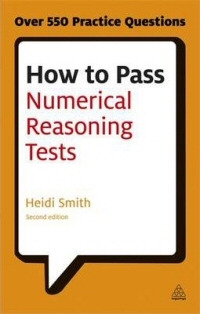 Packed with useful tips and worked examples, "How to Pass Numerical Reasoning Tests" will help you understand and answer the questions without using a calculator, and increase your confidence to take that test.